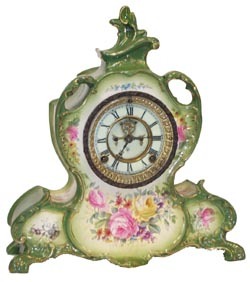 Ansonia Clock Co., Royal Bonn, "LaVendee", ca 1904, always one of the most sought after case styles because of the graceful flourishes, extensions, and openness. The color is outstanding. Medium to pale greens, yellow, rose, and purple flowers, on all sides, and of course just enough gold highlightto give it the beautiful Ansonia look. 8 day movement, half hour gong strike, 2 piece porcelain dial, open escapement, beveled glass, Rocco sash, all verynice. Just to be picky I will mention that the sash would look better ifcleaned. Ly-Ansonia, page 638, 3 examples.